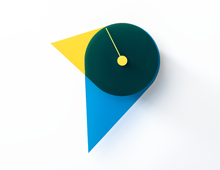 Birdy is the offspring of an assignment of a befriended architect to design a large clock for a new appartment building in Rotterdam. The primary design objective I gave myself was that children playing at the square could intuitively tell the time with a reasonable accuracy of a quarter of an hour. This resulted in a large square dial divided into four smaller differently colored squares. When designing this large clock, the idea popped up that I could graphically integrate the function of a dial in the form of the hands. 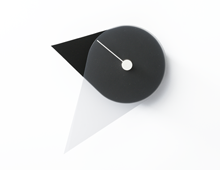 Though this fitted the ‘ less is more’ design adage and resulted in a clock without a dial that intuitively tells time even more exactly, the hands got too heavy for the large clock. And so the light and elegant version of Birdy was born.